Even more anti-climactic is Little Dieter Needs to Fly (1997). The nature of flying, and the verb “needs” suggest an emotional, perhaps even spiritual, desire to escape from the earth-bound and mundane. But when Dieter tries to explain his “need,” all he can muster up is a report of seeing a plane in flight and deciding that he wanted to take up flying. Despite the title, the film is less about his “need” to fly than its upshot: he became a pilot in Vietnam, was shot down and imprisoned, and later dramatically escaped. Herzog was so taken with the extended account of the escape narrated in Dieter that he re-created it—rather conventionally—in Rescue Dawn (2006). But nothing in either Dieter or Rescue Dawn suggests that there might be moral implications to satisfying such a “need” by flying missions over Vietnam, rather than, say, joining a flying club. That moral obtuseness had achieved a stunning apotheosis a decade earlier in what is certainly Herzog’s most reprehensible work, The Ballad of the Little Soldier (1984). The title refers not to size but to age: the “soldier” is a 12-year-old Miskito Indian (most of his fellow-“soldiers” are younger) fighting with the Nicaraguan contras against the Sandinista government. Herzog solemnly describes them as the vanguard of the world-wide struggle for indigenous peoples’ liberation. 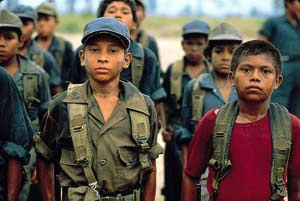 At the time, the film was derided for taking the wrong side in Nicaragua’s civil war, a point well taken, but somewhat beside the larger point: left or right, fighting to liberate indigenous peoples or to restore a thuggish regime of gangsters, these are not “little soldiers,” but children, not yet in their teens. As such, they are incapable of the moral judgments needed to make an informed decision to take up arms, one reason the Geneva Conventions—a document considered quaint in some quarters—prohibit using children under 15 as soldiers. The film shows the “little soldiers” in well-fitted child-sized camouflage suits and combat boots, looking a bit overmatched as they struggle to fire full-sized automatic weapons; Herzog asks no questions about funding for the spiffy uniforms. Instead, Soldier—rather like the conventional propaganda from which it seems virtually indistinguishable—dutifully chronicles the “little soldiers” going through their paces: describing how the Sandinistas killed their siblings and parents; taking target practice with a machine gun two of them can barely control, until the firing range is littered with spent shells; setting off on a combat mission that ends quickly—and, needless to say, without bloodshed—when the element of surprise is lost; as I recall, there is even a song. 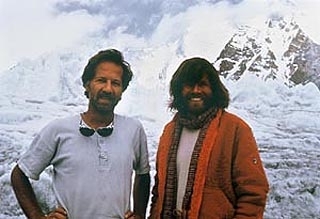 Near the film’s end, Herzog gives a perfunctory nod toward ethical questions when a crew member—not Herzog, who is the narrator—voices misgivings about how the Contras incite children to hate the enemy. It reminds him, he says, of how the Nazis prepared children for combat late in World War II. A valid enough point, certainly, but utterly wrong to the extent it suggests that things would be copacetic if the indoctrination were just a little more honest. Neither the film, nor Herzog, seems to recognize that the evil of using children in war cannot be mitigated by doing it “responsibly.” The film is particularly clueless when the narrator implicitly endorses combat training for the children by reporting—based, no doubt, on reports helpfully provided by the Contras—that the Sandinistas send children into combat without training. And once the indoctrination box has been dutifully checked, the film resumes its matter-of-fact, rather complicitous treatment of the use of child soldiers—and, by extension, of their Contra patrons—in the struggle for indigenous peoples’ self-determination. Given the jaw-dropping credulity and lack of moral sense, it’s probably carping to add that the film is rather dull and conventional, adjectives not often used to describe Herzog in his heyday a decade earlier. But here, as in Dark Glow, talking heads don’t make for compelling cinema.